Rokoko is a Eurostyle board game with an interesting take on deck-building. Each turn you play one of your employee cards and let that employee perform a task: hire a new employee, buy resources, manufacture a coat or dress, or invest in the ball's decorations. But not every employee is up to every task, so you must choose and lead your employees wisely – especially since each employee grants a unique bonus and some of these bonuses generate prestige points. You are a dressmaker / tailor with the objective to gain the most prestige points by providing dresses and coats to the distinguished guests as well as funding decorations and fireworks for the biggest ball of the season which is in 7 rounds time. This is a 2-5 player game (which is a good start for me as having the option of more than 4 players on the base game is always a plus). The gameplay involves part deck building and part worker placement. You use 3 employees (cards) each round to do your bidding via worker placement, with the mechanic of requiring you to use the cards you did not use last round, meaning hiring and firing employees is also a big part of the strategy. During a round, each turn (i.e. each card you play) you choose a primary action and each employee has a specific secondary action (although in some cases this is nothing) and there are three levels of mastery (apprentice, journeyman and master) who can perform different actions on the board. The actions you can carry out on your turn include, buying cloth / resources (to make attire), making attire, funding a decoration, buying / hiring employees, getting start player. As mentioned above there are different levels of cards, for example an apprentice cannot make attire but he can go and get the cloth for you. You exchange money through some of these actions and also gain a salary every round. There are a lot of other bonuses you can gain throughout the game depending on where you place your creations on the board, what decorations you fund and using employees secondary actions which really adds some depth to the strategy. The game is easy to learn but there is definitely an advantage for those who have played the game before, so may take a few games to get up to speed. This is quite a light euro game but also with a fair amount of strategy and a lot of “oooh…I was going to go there” but in a good way. I would say this is a great family game as well as a good game to play with friends. Don’t be put off if you think the theme is too girly, this really isn’t the case…if you’re worried you could always just make coats and be a tailor! -The number of actions available may be lacking for the more heavy strategy gamer – as opposed to something like Caverna but all the different bonuses mean it isn’t too light in this respect either. Should you own this game? I really enjoy this game and like the mix of deck building and worker placement so if you are looking for a slightly different take on worker placement which isn’t too heavy, with a great theme then go for it. If you are not a big fan of stepping on each others toes during worker placement then this may not be for you. Over the course of 7 rounds, players will be using their employee cards to take certain actions in order to either make some dresses, hire some more employees, build some decorations or even call a favor from the queen! But we must talk about these employees first because they are really the heart of the game! We have three different employees that we can use over the course of the game, each having a different colored thimble in the center of the card. You have the Master (Gold Thimble), Journeyman (Silver Thimble) and the Apprentice (Brass Thimble). These are important because they will allow you to perform actions based on what they are. For this, we take a look at what we can do on each round. 1. Claim the Queen’s Favor – The Apprentice can’t perform this action. You call a favor to the Queen, allowing you not only to get the first player token but to also gain 5 coins from the bank. 2. Acquire Resources – Everyone can perform this action. You can select a resource from the resource warehouse on the board. The key factor is that the price varies on what row you get it from and how many resources are left on that row. Once you buy one, you either can put it face down in front of you, keeping the fabric, or you can exchange it for some Yarn and Lace, depending on the symbol. 3. Make a Dress – The Apprentice can’t perform this action. Once you gathered enough resources, you can go ahead and make a dress to rent or to sell. The coins on top of where the dresses are determine how much you have to pay to make the dress. If you do decide to rent the dress out to someone, you can place them on the board with your player token on top of it. This in turn allows you to gain victory points at the end of the game if you control a certain hall with the most dresses. Also, some halls have golden fancy spaces which can only be done if you made a dress using a Master employee. 4. Hire a New Employee – Only the Master can perform this action – On the side of the board, you will see a couple of employee cards that will come out at the start of every round and each will be different. Once you do decide on who to buy, you pay the amount depending on how many employees are left. Instead of putting it in your discard pile, you put the new employee in your hand, giving you another turn in the current round. 5. Depute your Employee – Anyone can perform this action. Sometimes, the King may request your employee to be somewhere else so you gain some money in return. At least when you do perform this action, you can perform your employee’s secondary action before they go away for the rest of the game. 6. Fund a Decoration – Anyone can perform this action. This is where most of your money may go to fund certain statues, decorations, fireworks to to be used at the end of the game to net you more bonus points and hire musicians into halls to help break tie breakers should they come at the end. Building part of the fountain will allow you to gain some more money once everyone starts getting paid. So every round, you fill up the employee cards, fill up the resource warehouse, and put out dresses to buy. Every person gets to pick from three cards of the five they start with and will perform their main action. Some employees have a second action they can perform on the bottom of the card, which could range from taking another resource to gaining some coins. Remember that this changes with every round of new employees that come out so it could change the very game in your favor depending on who you decide to use. Once everyone can’t play any more cards, we gain some coins, with a base income of 5 coins plus however many more you gain depending on what side of the fountain you built, from having decorations to having a number of dresses. Once everyone gets paid, the old employees that haven’t been bought are put away and a new set of employees enter the game. You restock the resource warehouse and add more dresses to the board (all the dresses that haven’t been made are moved to the right of the track while any dresses that are in the unlit windows are discarded). Pick three cards from you draw pile and you begin the next round (if you can’t draw anymore cards, that’s when you grab all the cards in your discard pile and pick however many cards you have left to put in your hand). After 7 rounds, you go into a final scoring and this is where the area control of the game shines. Not only do you get points from the dresses you rented, if you control a certain area with more dresses, you get more points. In case of a tie, you use the decoration you built within the hall to break it. If there’s still a tie, then whoever has more dresses on the fancy spaces will get the points. Then, depending on if you have dresses on the very top of the building, you can move them to the roof and gain double victory points if you have built some fireworks. After scoring, you move towards the statues to give you points if you have a set of different dress colors you made. And finally, you gain the victory points on each dress you rented. Whoever has the most points is the winner of the game! I have to admit one thing. I’m not much of a fan of area control games. It was never my kind of game mechanic. Maybe that’s why I never liked Risk. But here, it’s done so well that it balances out with whatever you are doing with your dresses. It’s like you can go for some halls to gain points, or you can try to get some decorations up first so that you can avoid tie breakers. You have a choice in this game and not limited on what you can do. There is some deck building in this game but it’s a twist on the mechanic, meaning that you can look at all your cards and just get three to go forward. It’s nice to know that you have a choice this round and in the next round, you can make the same choices depending on what you buy. It’s always a nice mix that helps you determine what you want to do every round. If you want to get more employees so that your turn doesn’t end for the round, go for it. But often times, you need money and sometimes its best to stop. I like deck building games and this is a great way to put a spin on that mechanic. Overall, this is something that can be enjoyed. So one of the biggest reasons I decided to buy Rococo was because I was wondering what my girlfriend would like to play. I knew she loved to wear dresses and such everyday so I thought this would be a fine game to play. And man, this is a fine game to play! From the beginning, you knew you have to have some plan in order to get points at the end of the game, Do you start getting resources right from the start to make dresses? Do you build some decorations to get you more money at the end of each round? How about getting some more employees so that you can have more turns in a round? The choice is yours to make and everything you do is judged on these employee cards. Some get better with each passing round and you just have to decide what you want to do. My gaming group really loves this game because you don’t ever feel rushing and you can go at your own pace to determine what you want to do. Overall, dress making is indeed fun! 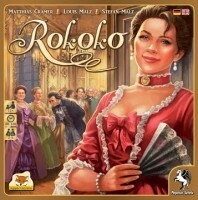 Add a Review for "Rokoko"